Birdsall, Jeanne. The Penderwicks at Point Mouette. 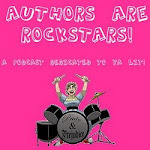 Random House Audio Publishing Group. 2011. Audiobook $34.00. ISBN 9780307915313. BRB, BOOKING MY VACATION COTTAGE IN MAINE! ...okay, only in my dreams. Sigh. But yes, this book is truly a treasure. It makes you want to stay in a cozy cottage on the coast of Maine and eat lots of pie, just like the three youngest Penderwicks and their friend Jeffrey do. It's the perfect summer read. For the most part, the book isn't exactly plot driven, but is thoroughly enjoyable due to the charm of its characters, with their quirky and relatable personalities, their worries and hopes, and their delight in the everyday. Like Elizabeth Enright's Melendy quartet, which is one of the inspirations for this series, this book is filled with small adventures-- the kind that make summer magical, and can be replicated by the reader. The Melendy kids inspired me to count shooting stars during the Perseids meteor shower, eat petits fours, and get the occasional manicure (hee, poor Mona!). 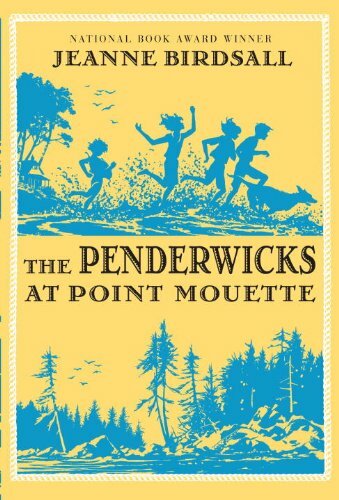 Likewise, Penderwicks devotees will undoubtedly be moved to build a fire on the beach and roast marshmallows, go boating, learn to play the piano (or at least appreciate it), and maybe hunt for lost golf balls. Lovely stuff. This the first Penderwicks book I experienced as an audiobook, and I wasn't sure I'd like it as well as the print version. One of the things I love best about reading this series is soaking up the language, and I didn't think I'd be able to do that with an audiobook. But Susan Denaker's performance is perfect for the Penderwicks. In addition to portraying each character with a distinct and believable voice, her narration has a gentle tone and precise diction, well-suited to the old-fashioned feel of the book. At first, I thought her pace was too slow, but as I relaxed into it, I realized the pace allowed me to soak up the language-- just like I wanted. Listening to this audiobook is like having a dear aunt read you a bedtime story. I wished it would go on forever. I came to love Skye more and more in this book, as much of the story is centered around her learning to take confidence in her ability to take care of her family in her older sister's absence. I always liked Skye, but she really shines in this book, sarcastic and straightforward. Maybe, too, it was the audiobook reader. She gets Skye's deadpan skepticism just right. Okay, now this next bit is only of interest to those of you who have read the series, but I have to get put it out there: I AM SO CURIOUS ABOUT WHO WILL END UP WITH JEFFREY. Because let's face it, somebody has to, right? Skye seems like the natural choice, but could Birdsall pull an Alcott and pair him with the youngest sister later on? According to this fascinating interview, the next Penderwicks book will take place six whole years (gasp!!) after this one, and the series finale will again jump forward in time, so it's possible. Batty and Jefferey do share a certain bond. OR... will Birdsall "fix" Alcott and pair the boy next door with the second-oldest, the sister he SHOULD end up with? (Because, seriously people, did anyone really like Amy with Laurie? Didn't think so!) Skye and Jefferey are so completely MFEO, in my opinion. I felt like there were definite hints at setting up a future romance in this book more than the others, but Birdsall is playing with us a little. AND I LOVE IT. Hmmmm. Am I the only one shipping Penderwicks? Probably! Still. Your thoughts? If you haven't read this series yet, and you've been wondering why nobody writes good, old-fashioned books for kids anymore... what are you waiting for? You'll love the Penderwicks, and the third book is no exception. I WILL BREAK SOMETHING IF SKYE AND JEFFERY R NOT 2GETHER!